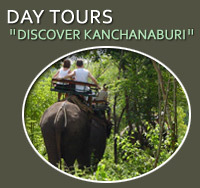 The best way to Discover Kanchanaburi. As tour agents we can offer a wide variety of different tours and packages. All of our tours include pick up from Pong Phen, English speaking guides, all transfers and lunch on the days of the tour. Tours range from 1 day sightseeing to full 2 or 3 days overnight treks and adventures into the wild jungle and countryside. Discover Kanchanaburi's most popular attractions, including Bridge On The River Kwai, Death Railway, Hot Springs, Sai Yok National Park, Krasae Caves.